I used– a mix of dates, figs, currents, dried cranberries, cherries, blueberries. De-pitt dates and chop. chop figs too. Preheat to 350. Butter 8×12 in baking dish (i use pyrex). Line w. parchment. Toss oatmeal, almonds (if using) and coconut (and wheatgerm if using untoasted) together and bake for 10-12 mins, stirring occasionally, until lightly browned. Transfer to large mixing bowl and if using pre-toasted wheatgerm (it will say on the package), add now. Reduce the oven temperature to 300. Put butter, honey, brown sugar, vanilla and salt in small saucepan and bring to a boil over medium heat. Cook & stir for one minute. Then pour over oat mixture, toss to coat. Add in dried fruit. Stir. When slightly cooled add in chocolate. Pour into prepped pan- w. wet fingers, lightly press mixture evenly into the pan. Bake for 25 to 30 minutes, until light golden brown. Cool for at least 2 to 3 hours before cutting into squares. Serve at room temperature. this sounds amazing — I’m going to try to do it wheat free and use flax seed meal instead of wheat germ. Any other suggestions? That should work fine! I forgot to mention that I actually added a handful of flax seeds in there. 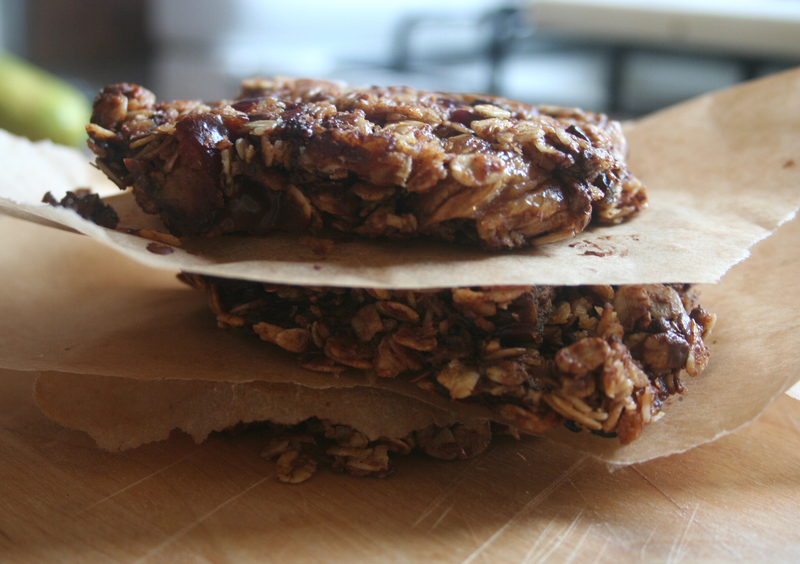 You can use a little extra oats too– i’d just see that flax seed meal + oats = 2 1/2 cups. hmmm — i’m more into the crispy kind of bars. less chewy more crunchy. got any ideas?